We originally included the Pixel and Pixel XL in this report, but later learned that this feature had been working correctly for those devices all along. Since the release of the Pixel last year it's been possible to swipe down on the rear-mounted fingerprint sensor to pull down the notification shade. It took a while, but the feature eventually came to the Nexus 5X, and finally the 6P. Ever since it came to the Nexuses, there was a bug wherein the axis wouldn't change along with the orientation. The release of the second developer preview for Android O (DP2) fixes this, and you can now logically swipe down from whichever side of the device is currently the top, depending on how you're holding it. Some users find this gesture useful, particularly on the larger 6P, as it means you don't have to reach for the top of the screen to see what's new. 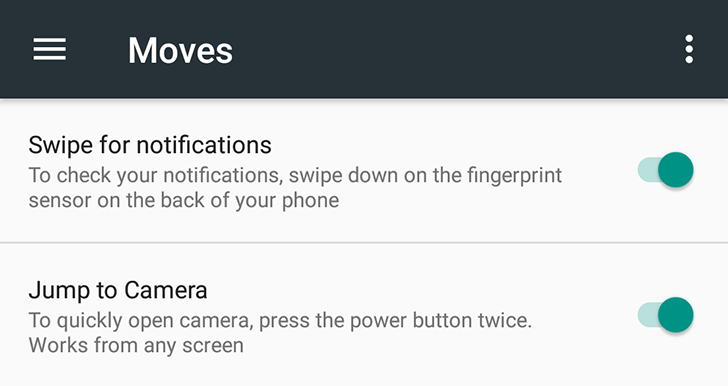 Others probably never use it, which is fine as you can easily turn it off in the Moves section of the settings. Previously, you would still need to swipe from top to bottom across the length of the phone regardless of orientation, even if that meant counterintuitively swiping horizontally when holding the phone in landscape (while watching a YouTube video in fullscreen, for example). This would obviously be jarring as the shade would then animate along a different axis to the one you'd gestured. Thankfully for anyone running DP2 and using the gesture, the behavior has been ironed out and now makes much more sense. Not a groundbreaking enhancement by any means, but another small improvement that will add up to a better overall Android experience for some people.